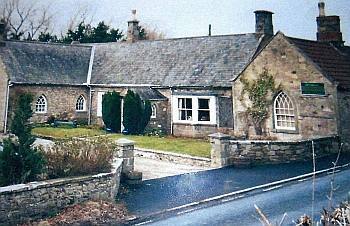 Pallinsburn cottages in 2014 (now The Coach House). 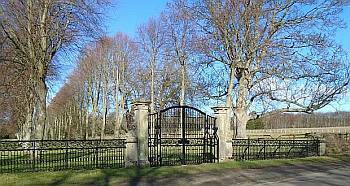 In the early decades of the 20th century, the Conquer family were living at Pallinsburn Cottages near Crookham. John Conquer, head of the family, worked as a carter, quarryman and farmer; two of his three sons, James and George, also lived and worked with him. Between 1911 and 1937, the three men kept a series of account books and diaries which give a detailed picture of working life in that part of Northumberland. These volumes are now held in Berwick Record Office, together with modern transcriptions, and extracts from them form the basis of the following account. John Conquer b. 1852 in Swinton; d. 1924. James Conquer, son, b. 1884; d. 1960. George Conquer, son, b. 1888; d. 1953. 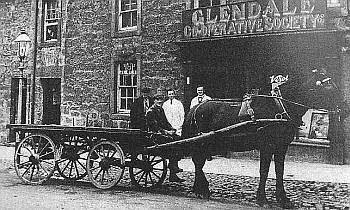 A flat cart in Wooler 1915, similar to a type probably used by the Conquers. Photo: Derek Fairnington. By 1911 John, now self-employed as a whinstone quarryman, his wife, three sons and a daughter have moved to Pallinsburn Cottages, (now known as The Coach House) in five rooms. As well as the haulage business and quarry work, the family worked a small farm (probably leased from the Pallinsburn Estate) growing hay, corn, turnips and potatoes, with land at Dunny’s Law, which is directly opposite The Coach House at the junction with the Crookham road and the A697. John Conquer’s account books begin in 1911. They give a picture of the crops which were being produced, where goods were transported, and the means of transport used to carry them. A 1903 Steam Wagon, of the type possibly driven by George Conquer. Photo: Grace’s Guide to British Industrial History. The first of the diaries dates from 1914 and was kept by James Conquer. During the first three days of January he sawed sticks and “led” turnips, probably to feed livestock kept inside, the usual everyday tasks in winter. The rest of the month he worked in Flodden quarry, carted sand and cement for Pattersons the builders at Branxton and J.S. Rule, slaters in Ford Village. Cornhill Station was still in operation at this time and all the coal and building materials were led from there. Akeld Station was also in use, and there are records of a shop owned by R. Lyall and Son, supplying groceries, coal and animal feed. A variety of local haulage jobs were also carried out. 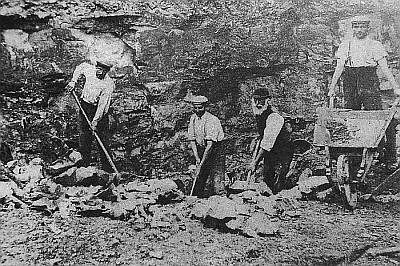 Workers in Doddington quarry, c.1895. Photo: Derek Fairnington. The pattern of work continues in similar vein with extensive road works at Crookham Corner and extraction of timber on Flodden Hill. The family also owned a steam wagon, which involved much cleaning of pipes and boiler, with frequent visits to Mr. Turnbull at the Blue Bell Smithy, next door. 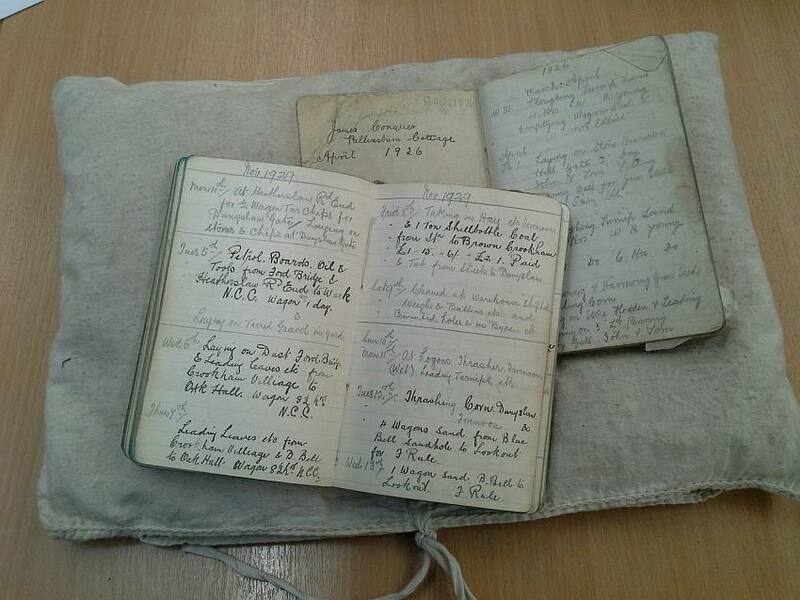 George Conquer, the younger brother of James, was also keeping diaries in 1915/16. 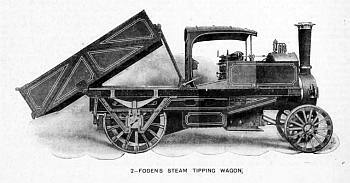 There are similar entries relating to work on the roads, and in particular the maintenance of the steam wagon; this was used for longer journeys from Ford Mills to Carters Granary at Berwick for Mr. Hogarth, and making frequent journeys to Berwick Station with pot barley from Ford Mills (Heatherslaw?) He was leading bran, flour and sugar for Lyall at Akeld, and stone was being led from Doddington quarry to Ewart for G. Patterson, the Branxton builder. He also worked at the Flodden and Branxton Moor quarries George’s interest in gardening is now recorded and a mention of a pony and trap for hire. In May of this year several “flittings” (the removals of furniture etc. of farm workers) were recorded. On October 4th, he “flitted” George Marshall from Branxton to Twizell Toll. Both Twizell Station and Twizell Mill were operational at this time. George was also a farmer and gardener, with details duly recorded. In January 1917, both James and George Conquer enlisted for military service in WW1, and their father John carried on the business alone. George joined the Auxiliary Service Corps as “a Steam Wagon Driver”. After the war James’s diaries resume in 1923; George’s diary does not begin again until November 1928. 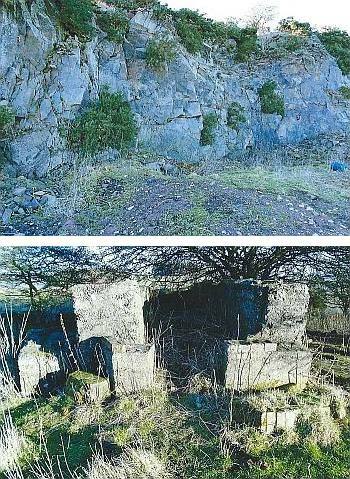 Branxton Moor quarry (2015) and the remains of the explosives store. When James’s diaries resume in 1923, the farming and quarrying work continues with very few days when no work was done. It was not unusual for diary entries to show work on the roads plus farm work, eg. binding and stooking corn, presumably in the evenings. Wet days were spent about the farm buildings doing repairs etc. There was much contract work done on the roads, for both Glendale Rural District Council and Northumberland County Council. There was a lot of water being led, possibly to bed in the stone and chips, or to fill up the steam wagons. They apparently had a weigh bridge and the weights were taken to the “Blue Bell Smithy” for adjustment, then to Wooler Police Station – presumably for some sort of licence. By September, the delivery of coal from Cornhill became a regular source of income, with loads to both local businesses and villagers. There appeared to be different grades of coal from both Scremerston and Shilbottle, with a haulage charge of 8/- (shillings.) On Wednesday December 12th, polling booths were collected from Crookham School and taken to Coldstream Station following the General Election. There were no days off recorded during the year. James’s diaries continue in similar vein. A new horse was bought at Kelso, and in September, “bagged coal” is mentioned for the first time and “bagging” coal (obviously from a “depot” at Pallinsburn Cottage, is now a regular task with the wagon doing multiple drops around Crookham and Milfield. The remaining diaries have no name attached to them, but the style and content matches the earlier entries of George Conquer. Among the next activities recorded are repairs to the house and buildings at Pallinsburn Cottages and deliveries of firewood from Pallinsburn (the Pallinsburn Estate) with an extra delivery charge of 1/- (one shilling) for unloading. Coal is now delivered by the hundredweight or ton, as opposed to per bag, 12 years ago. 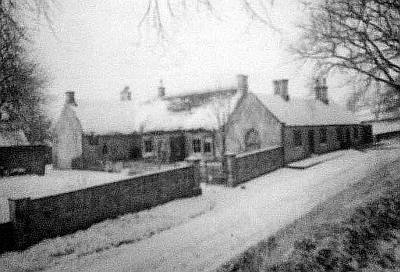 Pallinsburn Cottages in snow, c.1910. Photo: Rev. Moses Forsyth/TillVAS. In 1929 the regular road work and farm/garden work continues, with more attention given to prices. George is also transporting livestock to and from Kelso. There is mention of a “motor” and repairs are more descriptive of a petrol engine vehicle. There also seems to be more local building work with materials led from the railway stations to Ford Forge and Chillingham for F. Rule. The Spring of 1930 brought the usual daily round of repairs to buildings and machinery; haulage, road and quarry work. In the same month, George records moving a 25lb. barrel of gunpowder from Coldstream Station to Flodden Quarry – there is no mention of any safety precautions! – and there are similar entries in August and December 1931. Pigs were bought at Kelso Mart, a calf at Berwick, £2/15/- (£2.75) and in March a new horse was bought for £14. The brothers also appeared to run out of storage space as George noted “Ground oats laid out in front room for Lowick.” 1931 continued as previous years, with road works, gardening, general haulage and farming. Coke is used more at this time, apparently from Gas Works at Coldstream and Wooler. There was more livestock haulage from Kelso Mart both for himself and neighbours. Internal repairs to the house were carried out and there are records of deliveries of groceries for Lyall’s of Ewart, with several local drops. The diaries stop on December 31st 1932 with the comment “In Bed”. No reason is given. Some of the accounts continue until 1937. The Conquer diaries and accounts are held in Berwick Record Office (BRO 1876). There are also transcripts of the documents available at the Record Office. Click here for a sample portion of the diary transcripts (for 1914). Click here for a transcribed page from John Conquer’s Threshing Account (1922). This shows how threshing of the corn was done for each smallholder’s acreage of land. The names mentioned are those of neighbours of John Conquer. Click here for the Blue Bell Smithy at Pallinsburn, the history of a neighbouring property. Two of the volumes of the Conquer diaries in Berwick Record Office. Copyright for photographs, unless indicated above: Maureen Charlton / TillVAS.